“D.W.” participated in basketball, volleyball, and swimming in high school. She was active in many clubs including: student government, ASB, Band Club, Drama Club, and the Environmental Club. She only played basketball for 2 years. She works hard every day and is making great strides. 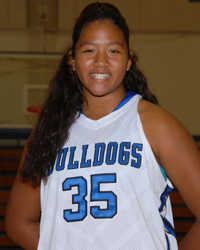 She is a good rebounder and will add size for the Bulldogs this year. She was born in San Francisco to parents Dennis Won and Ouida Car. Her sister is Danielle (9). Her hobbies include singing and dancing. Her hopes for this season is to get improve her game.